The winter season conjures up visions of parties, sugar plums, snowfall, and hot chocolate. However, it also brings the winter blues—and that has nothing to do with music or even a decorative color scheme. The lack of daylight can cause severe depression in some people. Technically, it’s called “seasonal affective disorder,” and it can affect people who don’t get enough light during the year’s coldest, darkest months. Of course, you don’t need a clinical diagnosis to know that smart lighting can brighten up those dull winter days and nights. 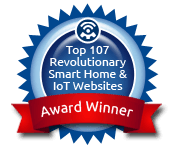 While you’re stocking up on canned goods and firewood, we here at Electronic House are loading up on smart lighting solutions for the season. This type of technology can brighten up any room to keep you out of that winter funk. Still not enough to justify the cost? 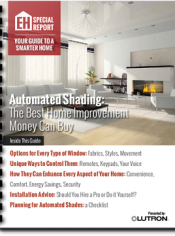 Here are five reasons you need to have a smart lighting system in place this winter. It Gets Dark! 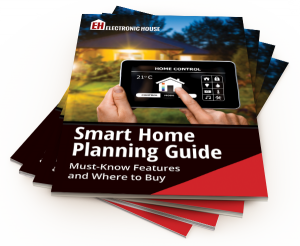 Those short days and long nights are a good reason to install a smart lighting system. The end of each day shouldn’t have to involve a dance to the front door to avoid ice, lawn ornaments, and other obstacles. With a key fob in your car or even your smartphone, you can trigger smart bulbs or an entire whole-house system right from your driveway. Connect that controller to outdoor lights, lights in the garage, lights by the front door, and/or lights inside the house. 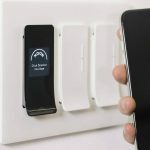 Many smart lighting systems also have options for motion sensors and/or scheduling, so you never have to enter a dark house without even lifting a finger. It’s Party Time. Gift giving, cookie swaps,: family dinners, and other festivities; smart lighting can add a little something special to that gathering. Scenes work great here, allowing you to control specific lights and set specific dimming levels so that you get the same results every time you push a single button. For instance, a PARTY scene can dim lighting in the living room and brighten up hallways or walkways. To make the occasion a little more joyous, create a HOLIDAY scene that will display several shades of red, green, or any other color of lighting you can imagine. Also, consider smart lighting for the outdoors. Nothing kills a party more than someone slipping on the front steps. Think about setting up motion detectors to trigger the perfect path to the front door or putting lighting in the backyard to highlight stairs, decks, or even architectural elements. You Go Away. This is the time of year when you’re constantly visiting someone. Friends, family, ski slopes, beaches; people are constantly coming and going during the winter months. If Home Alone taught us anything, it’s that ’tis the season for break-ins! Use a smart lighting system as an added security measure. It can make your house look occupied, even when you’re away. However, it goes beyond just lighting up a porch or side light when someone approaches. Smart lighting allows users to set schedules that will mimic a daily routine. 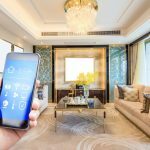 If you want to mix things up, some systems allow for more customization—or you can opt to control lighting manually from a remote location using a smartphone, tablet, or computer. You’re Already Spending Enough. Holiday gifts, hostess gifts, travel expenses, and heating the house can chip away at your winter budget. Instead of adding to those costs with excessive, unnecessary lighting, you can use a smart lighting system to save a few bucks on electric bills. The remote control aspect of smart lighting allows you to turn off the lights you accidentally left on or turn on lights you need at night but didn’t want running all day. Of course, you could also use scheduling to make sure lights are only on when they need to be. 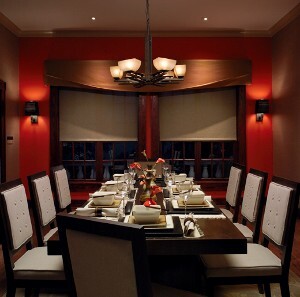 According to Lutron, even adding in smart lighting dimmers can save energy—which saves you money. If you have family members who are always forgetting to turn off bathroom and hallway lights, also think about adding occupancy sensors. Sure, it’s not quite as elaborate as the Light-O-Rama displays that we see every year, but this type of smart lighting can add a decorative element and a little ambiance throughout the holiday season and beyond.